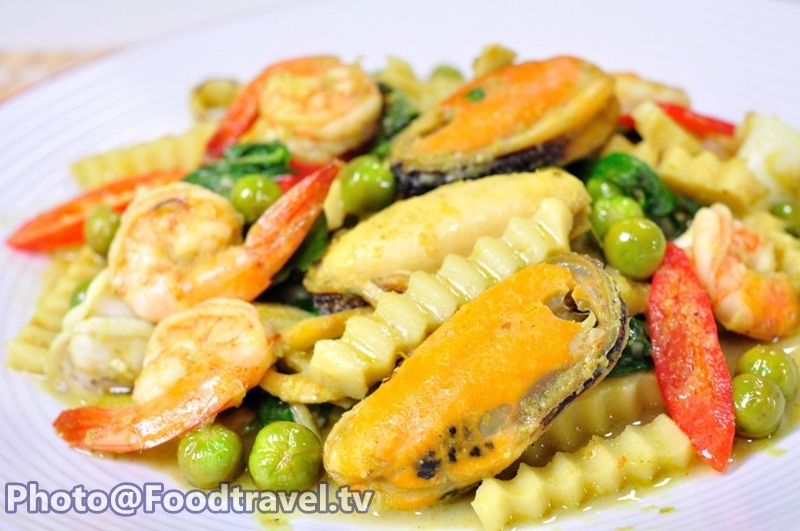 Green Seafood Curry - We can adapt from the original to dried green curry and use seafood for this menu too. 1. Slice hot pepper then cut the leech lime leaves and slice the bamboo. 2. Warm the pan then put the oil and curry paste in to the pan. Fry them with shrimp , squid and Sea mussels. Fry until they done for 50%. 3. Put bamboo , pea eggplant , leech lime and coconut milk on to the pan then fry them together. After that put the fish sauce, sugar and fry until they’re well combined. Put the pepper mint for last then ready to serve up.